If you can remember when you first bought a car or even when you started to tell people that you had recently obtained your license, anybody and everybody likely told you their stories and tricks on vehicle maintenance. It probably started with your parents telling you about fluid levels. It also likely included your friends telling you all about the maintenance ‘hacks’ to keep their cars in good shape. There was possibly even a time when a co-worker told you about an episode of ‘Top Gear’ they once saw and are sure they are now a mechanical expert. As helpful as (the majority) of these tips are, when it comes time to ask about a basic outboard motor, nobody seems to have much of an idea what to say. If you are lucky enough to be buying a boat, even a simple boat with nothing more than a basic outboard motor and want to learn a bit about the engine itself, below is a post from USA Synthetics which aims to help. Think about the last few times you drove your car. The time you drove to the store and back for milk. Could you hear your engine screaming at you? How about when you were zipping through the city during the day? Nothing? Not even a loud noise when you were cruising along the freeway? The reason why you don’t hear your car screaming out in agony is that you have a range of gears to choose from to provide relief when you reach a comfortable cruising speed. However, if you can remember last time you were in a boat with a basic outboard then you know that the reprieve from the sound never comes. In fact, it just keeps getting louder the faster harder the throttle is pulled until your reaches its maximum RPM and you are sure it’s going to explode. Of course, it doesn't explode. In fact, the noise continues and the boat keeps moving. 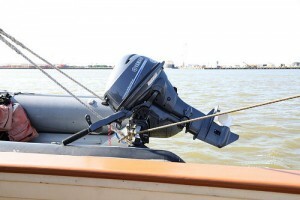 And while this is the way a basic outboard was designed to operate, it wasn’t designed to do it without help. Apart from the grease you will use on the outside, the internals are protected with marine-based engine oil. This specially designed film provides your boat’s engine with the support it needs to function at high RPM for longer, working to keep you enjoying your vessel. Click here to buy AMSOIL 10W-40 Synthetic Marine Engine Oil and keep your outboard motor in good shape. If you aren’t sure if this is the right oil for your needs, don’t hesitate to call USA Synthetics at (405) 388-6170 and speak with an expert. Alternatively, check out the online store for more information about the range of products available. Thinking back to the travels at the start of the article, what did you do with your car when you weren't driving it? For example, it’s likely that you parked it in undercover parking when you collected your shopping or even left it in your home garage in between errands. What you didn’t do was leave it out in direct sunlight all day long until you were ready to start the engine again. Unfortunately, the same can’t be said for an outboard motor which is left in direct sunlight the entire time you are out on the water. Even though the temperatures may not be high, the rays from the sun are working to get the engine hot. As you can imagine, this doesn’t put the engine in the best place when it comes time to start and get moving. It’s for this reason that boat owners need to make smart choices when looking at which engine oils to use. A conventional oil isn’t always able to withstand the high operating temperatures and can often break down, leaving your engine susceptible to engine damage and potentially leaving you stranded in the middle of a lake or your favorite fishing spot. Be sure to keep your boat and its engine running in good shape with basic maintenance and a regular synthetic oil change. To find out more or to get the best products for the job, speak with an expert at USA Synthetics by calling (405) 388-6170. Leaders in the field of engine maintenance and synthetic oil, you can be sure that USA Synthetics will not only help you take care of your engine but also help you get the most out of it.